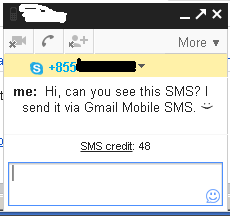 Do you know that we can SMS from Gmail chat directly to phone in Cambodia? Of course, I just knew it and tried few days ago. It’s simple and easy to use. There are two operators supported this feature for gmail in Cambodia: CellCard & Smart Mobile. It means if you go online chat of gmail and you could not find a person you want to chat online, you can drop s/he a SMS to his/her mobile. SMS via Gmail is Free? No any special configuration, just fill up the phone number of your contact and start send the SMS as you wish, you will see at the top of the input box, number of SMS credit you are available.